Pupils in this activity constructed a functional sundial and looked for a suitable place for its location. The outputs were presented to pupils in a parallel class. The activity was participated by 1.C (19 pupils). Their aim was to build a functional sundial and understand the reason why the shadow moves during the day. The pupils succeeded in their task. As a result, they wanted to create their own sundials during the holidays. However, we could not secure a suitable place in the school year where the sun shines all day and where sundials could be placed permanently. In the first phase, there was a discussion on the topic “How did people measure time in the past?”. 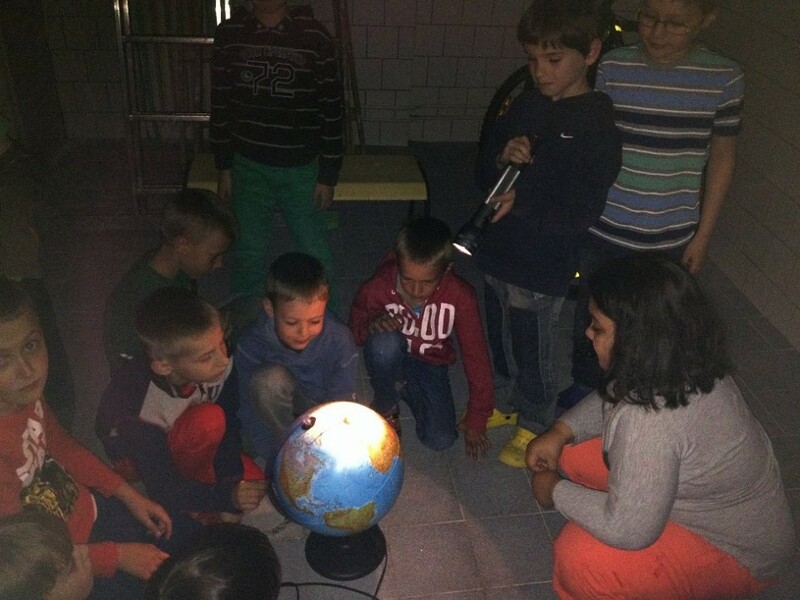 Then, pupils visited a planetarium and watched the programme About the Moon and the Sun. In the next lesson, they carried out an experiment during which pupils observed the movement of the shadow on the Earth during its rotation around the axis using the following aids: globe, skewers stuck into plasticine, flashlight. Using photographs, pupils were familiarized with historical sundials, their forms, and location. Following this, they watched the movement of their own shadow during the day on the school yard and located the most suitable place to place a sundial. In the next lesson, they first created designs for the sundial and then the sundial itself. After verifying its functionality, they carried out a test in a darkroom and presented the sundial to other classes. We had problem with the sunlight in our school yard. We usually have sun only for a short period of time. We used the Internet to find how the sun clock works. I learnt to draw on the stone. In the planetarium we learnt how the planets move round the sun. Next time we would make the sun clock on the place where the sun shines longer.